The world famous Harlem Globetrotters, featuring some of the most electrifying athletes on the planet, will bring their spectacular show to Las Vegas on Feb. 9th. The famed team will feature a star-studded roster that includes Big Easy Lofton, Ant Atkinson, Hi-Lite Bruton, Thunder Law, Bull Bullard and Cheese Chisholm - plus female stars TNT Lister and Ace Jackson* - the Globetrotters' one-of-a-kind show is unrivaled in the world of family entertainment. Every game will showcase incredible ball handling wizardry, rim-rattling dunks, trick shots, hilarious comedy and unequaled fan interaction. You won't want your family to miss it - use promo code FUNFAM to save 25% off your tickets. 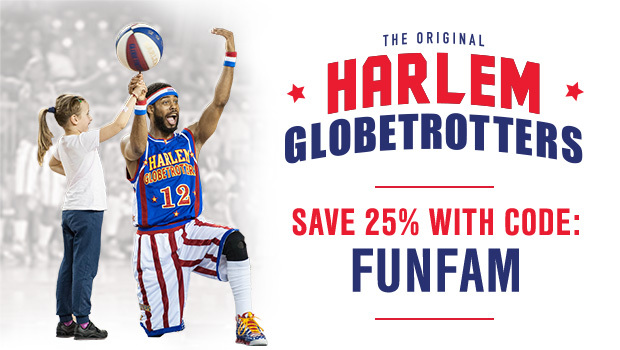 http://www.harlemglobetrotters.com/tickets. We had such a wonderful time yesterday at staples center ! The Harlem globetrotters are so much fun to watch ! Their was something going on all the time ,they had dancers , ram players , mascots and they played around with Julie Bowen from Modern Family . And it was great because she played along with them ! The Harlem Globetrotters will keep you wondering what will happen next ! They have so many tricks you just wonder how can they play like that ? They even had the crowd clapping and laughing along with them ! I really look forward to seeing the Harlem Globetrotters , they've been around for years and they make you feel happy ! You can forget about everything else because they make you feel like a kid again , your just in the moment and happiness is all you feel ! Everyone should go see the Harlem Globetrotters ! I hope they stay around for many more years to come !